Oozing style and class, the 6′ x 8′ Windsor Curved Roof AERO Shed is one of the most dynamic and cool looking sheds that you will ever see. The first thing that will catch you eye is that incredible curved roof which is not just here to look fantastic; it is also going to protect everything inside from anything the weather can throw its way. 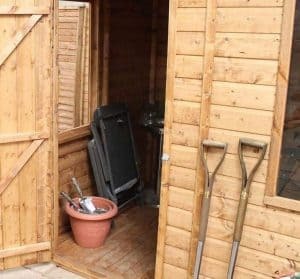 The look of the shed is very open and friendly thanks to those three large windows which will allow plenty of natural light inside so that finding your items will never see you stumbling around in the dark. With a look all of its own this is one very unique shed that is going to stand out in any garden it is placed in. Windsor have made this a shed which manages to be just as strong as it is great looking. 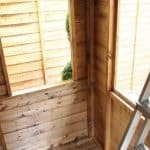 They have used tongue and groove boarding for both the roof and floor to not only help the appearance of the shed, but also to make it very strong. The tongue and groove shiplap cladding is made from very impressive wood and will still look fantastic many years in the future. Offering high quality and a truly incredible design this is a shed which really does have it all. This is one of the most stylish and interesting looking sheds that we have seen in many years. This is the kind of shed you buy when you want something that not only offers you space to store items, but also be something that looks great as it stands in your garden. 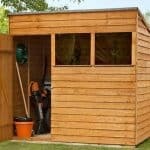 The width of the shed is a very impressive and eyebrow raising, 7 feet 11 inches and the depth 6 feet 11 inches. This offers you a very nice amount of floor space to make use of. One thing that we really loved about this shed was how it was also quite high. At the highest point it actually is 7 feet 1 inch high. 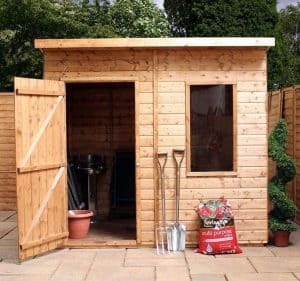 Making this a shed which is just perfect for keeping taller and more awkward shaped items tidied away. Even at the lowest part of the shed there is still 5 feet 8 inches of height. So all around this is a shed which is offering you a very generous amount of headroom. 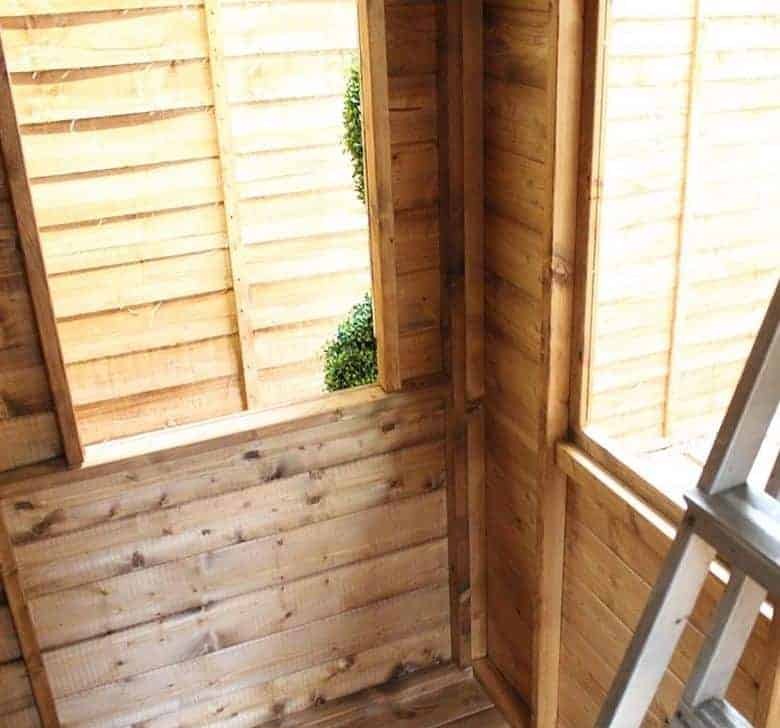 The roof is one of the first things you notice about this shed and the first time you see it, we are sure you will walk around it a few times trying to figure it out. This is because this is a curved roof which is very unusually, but it actually is every bit as reliable as a traditional pent or apex style roof. The curved design means water always will run off and not pool on top looking for a way to get in, but while it is very practical there is no denying that this roof is just very cool to look at. To back up the good looks, Windsor have used 12 mm thick tongue and groove boards for the roof and then covered them with some very top quality felt. 12 mm thick, tongue and groove shiplap cladding has been chosen for the walls and we really do love the way that it looks. This cladding is always going to stand up and not allow any rain to make its way inside. This style of cladding we feel always looks great, but the quality of the wood and how thick it is make it very strong so that it will be able to last for many years. When a shed looks this pretty it can be easy to ignore just how strong it is and, wow is this one very strong shed. While the cladding is part of the reason for this the very robust 28 mm x 28 mm frame which is made from very high quality timber is certainly another reason. We are impressed with the frame which Windsor have used inside here. This frame we feel will make it so the shed will not start to get weak or have any other kind of structural issues during its life. Most of the time when we look at a new shed we expect to see the standard solid sheet boarding making up the floor. Well we were very surprised with the tongue and groove flooring which Windsor have put inside here. This floor is very strong and at 12 mm thick just like the walls and roof. It is going to last for lots of years. As well as looking very high quality and being long lasting this flooring is going to be able to take an incredible amount of weight. Windsor have not cut any corners with this floor and have also included their heavy duty, pressure treated floor joists as well. With how amazing the rest of the shed looks it is very easy to take for granted just how incredible this floor is. Windsor are making sure that your new shed is starting life off in the right way by given it a free base coat treatment. While this is something we can appreciate, we still highly recommend that you give it your own coat of treatment shortly after construction. 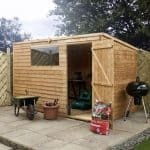 As is the case with most other wooden sheds, annual treatment will be required to keep the shed looking fantastic and to make it stay strong. 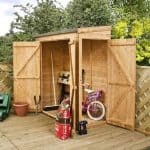 Once treated the shed will then have a ten year anti rot guarantee which as long as you do remember to treat the shed, we are sure is something you will never have to make use of. The door is 2 feet 5 inches wide and 5 feet 8 inches high. While this is only a single door, we are impressed with how much space it gives you to get things in and out. The door does come with a pad bolt so that you can securely close it and it is also held in place with two very high quality and good looking hinges. The door can be placed in a multiple positions so be sure to think what would suit your needs best before you install it. A shed of this size offering three large windows is not something we see very often, but we do really like it. These windows are made with shatterproof styrene so for families with children there is never the worry of broken glass. Just like the door these windows can be placed in different positions. By having three windows, you get all the natural light inside that you could possibly want. We are impressed with the security that the 6′ x 8′ Windsor Curved Roof AERO Shed provides, but it does not come with any way to lock the shed. We do not see this as a huge problem thanks to how easy a padlock can be used with the pad bolt. This is not a very private shed thanks to those three large windows, but the windows are such a huge feature of this shed we really cannot be too harsh on it for that. Still we do know some people like to keep their things hidden out of sight, which if that is the case then you will want to add some blinds or curtains. If done right we feel that this could actually make the shed look even nicer. 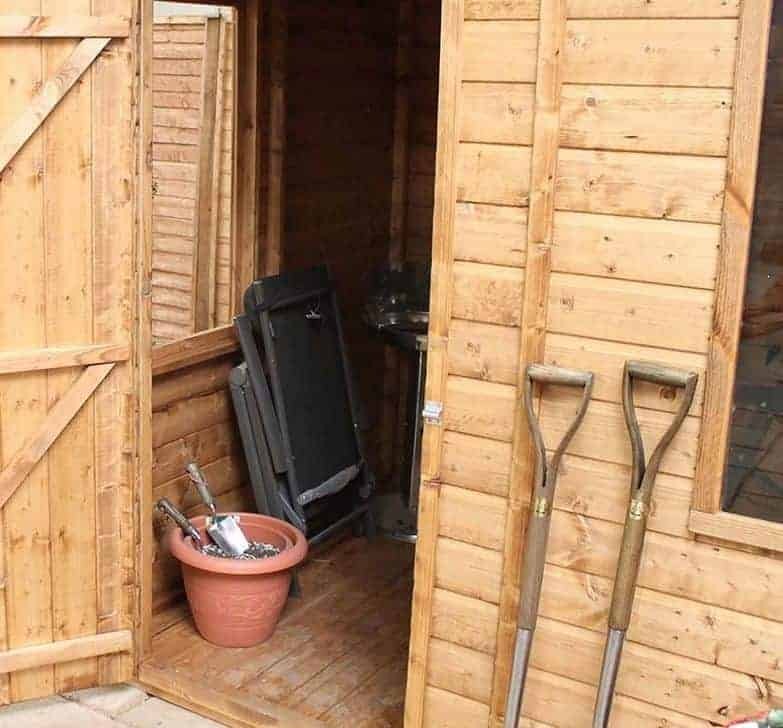 While this is a shed that has a great look, if you want to give it a little touch of your own personal style then be sure to pick a coloured wood treatment which will give a bit extra personality to the shed. Ivy green and red cedar are just a few of the interesting colours that we are sure would give this shed an even more unique look. The only thing that you may want to buy as an extra would be a padlock, but as this is something which can be purchased in most pound shops, we do not feel it is something that is a problem. Windsor really have done a great job at making this shed high quality without giving it a hugely expensive price tag. This does require a little effort from you, but as long as you do then this will last you many years. 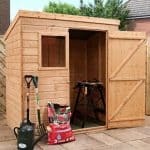 This is not the largest shed we have looked at, but the storage space on offer we feel is still good and if you think before you place items inside then you can really work wonders with what you have available here. You and another person should have this up in a few hours. The instructions are detailed enough that if you just follow them carefully, you should not have any problems. Offering such a unique design and high end materials at this price really did surprise us. 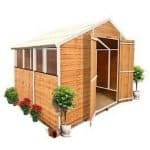 At under £500, you are getting one very attractive shed here and also getting a good amount of space for your money. Final Thoughts: This really is one of the most eye catching sheds that we have seen in some time. 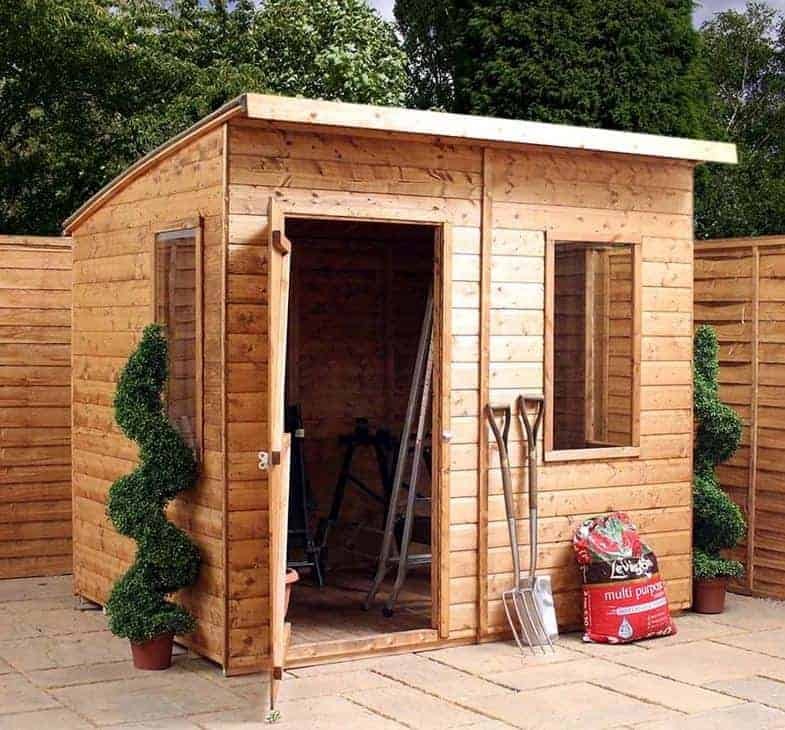 The 6' x 8' Windsor Curved Roof AERO Shed is more than just a space to throw in your lawn mower or gardening tools when you have finished with them. 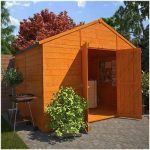 It is a shed that has been made to be a real feature of a garden and provide you with storage space, but in a very stylish way. We are sure that people who buy this are going to be very pleased with not just how attractive it looks, but also with how very high quality it is and of course the fact that it is only, £489.99 is fantastic too.